NASCAR TOURING SCHEDULES – YOU THINK IT’S EASY? My Mom always used to tell me, “Don’t criticize something until you know all the facts.” Or how ‘bout this one, “Don’t knock it until you try it.” I bet you’ve heard that one a thousand times. I’m sure whomever coined the latter statement (and I’m sure my Mom wasn’t the first to use it) probably wasn’t talking about putting together racing schedules, but it certainly does apply. Problem is, if any of us regular folk ever really tried to put all the nuts and bolts together for a touring racing series, we may never want to do it again. NASCAR’s purses per race for its Elite and Grand National Divisions range from a low of $29,000 to a high of $125,000. And while purse structures have certainly not matched the rise in the cost of racing itself during the past few decades, tracks have seen the rise and fall of the economic rollercoaster themselves. Expenditures have gone up for them too while attendance has either stayed the same or, in some cases, declined as track operators battle other forms of entertainment provided by society today. “In years gone by, a short track in Iowa or New York could bring a short track series to their track and they would make a killing financially,” states Hawk. “Now they’re battling so much more. And if there’s bad weather, they are wondering how much am I really going to lose? So when putting together a Touring Series season, it has to make sense for a track to agree to schedule one of NASCAR’s Grand National, Elite or Modified division races. “It wouldn’t hurt for the competitors to understand, NASCAR doesn’t pick a date when a racetrack should run a race. In 90 percent of the cases, the racetrack picks the date that is best for their financial model, best for their schedules; best so that it doesn’t conflict with anything that is happening in their community. Case in point, NASCAR’s Busch North Series opener. 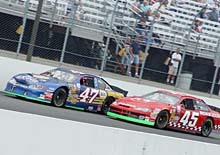 When the schedule was first released, the opening date for the series was June 12th at Thompson Speedway in Connecticut. That has since been changed to May 15th at Lee USA Speedway in New Hampshire, but it was a struggle for NASCAR to obtain early dates for that series. Herein lays the problem. When NASCAR released its 2005 Touring Series schedules a little more than a week ago, the critics were climbing out of the closet to take a jab at NASCAR. Why were they put out so late? Why aren’t there more races? Why do some of the series seasons start so late? Why is this track on? Why is this track off? Why aren’t the purses higher? The questions, more in the form of bashing than in an inquisitive nature, went on and on. And don’t think NASCAR wasn’t listening. NASCAR's Don Hawk talked exclusively with our Bob Dillner regarding schedules. For us to understand the answers to the critics’ questions, we must first understand the process. That process begins and ends with the tracks themselves and the issues all surround the almighty dollar. Coming up with race schedules for eight divisions is not an easy or overnight task. “Scheduling, as I understand now, is a very tough and tedious process,” continues Hawk. “As the environment changes economically in this sport, it is becoming exceedingly more difficult for a short track in America to pay a purse, to make ends meat and to keep the gates open week after week. “And there was a phone call that came into me this morning that a racetrack may be in financial trouble and we may need to rebook a date. I told them that as soon as the clock hits 8 o’clock in the morning on the West Coast, start making the calls. Even if we have to subsidize the race to some extent, we need to fill the race for the competitor. And there are ways to change things for the future to make everyone happy. Among the ideas being tossed around are consolidating the touring series, finding new, more economical rules and learning from other short track series that are currently doing well. That’s a story for another day, and we at Speed51.com will explore those issues with Hawk. Right now is the time to answer the questions about the schedule, not ignore them, and Hawk knows that. Schedules for the Busch North (above) and West Series have been tough. Some may say Hawk is skirting the issue, but in reality, he is not. Whether you want to believe it or not, he and the others he has surrounding him do care about the NASCAR Touring Series. And there are some examples to back up this claim. “I’ll give you a perfect example,” Hawk says emphatically. “Grand National West; there’s not a sponsor on that series. You might as well call it the NASCAR West Series because we pay the bills. We put the officials out there; we put them in the hotel rooms; we fly them on the planes; we put the templates there and the equipment and we pay the purse. That’s the kind of commitment we have that sometimes is overlooked. “I am absolutely not satisfied with the schedules we released. We did so to get some information into our folks’ hands so that they can realize that there really are 50-Elite races booked, 11 races in the West Coast with two to be decided, 12 in the East with two to be decided. We have not stopped working on booking dates. “Two things that really bother me are that we don’t have enough race dates to make everybody happy and we took way too long. One of my objectives is to have it done sooner and at least give somebody a picture earlier in the year of what the model for ’06 is going to look like. NASCAR knows its Touring Series are important to the future development of itself as a sanctioning body. Some may have criticized them in the past for ignoring their short track roots, whether that is true or not is irrelevant; the point is that they are paying attention now. The addition of Hawk, the support of NASCAR’s Jim Hunter and his team, and the effort they are putting forth prove that NASCAR is attempting to make their grassroots racing programs better. Time is of the essence in developing the future of NASCAR’s Touring Series. It’s also the key element in trying to make NASCAR’s short track world a better place. And it’s a give-and-take situation in relation to time; we need to give it and NASCAR needs to take it in order to move forward into the future.